After seeing a variety of “Man-Packs” online, I decided to construct my own using the concept shown by Matt M0LMK and you can see the results of my efforts below – The primary requirement was for the FT-857 to be protected during transport and to take the LDG ATU and a 7Ah battery. There are lots of other examples of “Go-Packs” online – including 19″ flight-case style. As I wanted something to fit inside my backpack and/or bike panniers, the emphasis was on a small size. Copper pipe solders with a blowtorch and garden variety solder, but you MUST ensure the pipes are cleaned prior to this – Ever tried to solder to a metal surface and seen the solder form into a ball and roll away? That’s what happens if your pipes aren’t cleaned and fluxed properly! 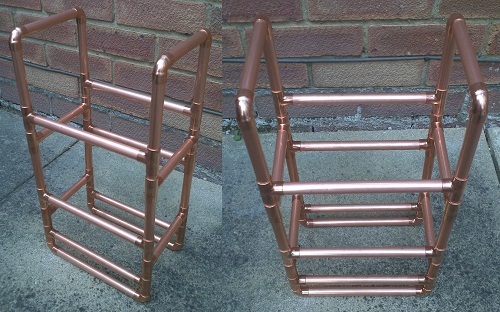 Also, let gravity do the work – Solder the joints that face upwards first, let the whole frame cool down (around 15 minutes, copper retains heat!) and then rotate and solder the rest. 15 minutes is about right for letting it cool down, the whole frame stays hot for a considerable time, so be careful what you touch. 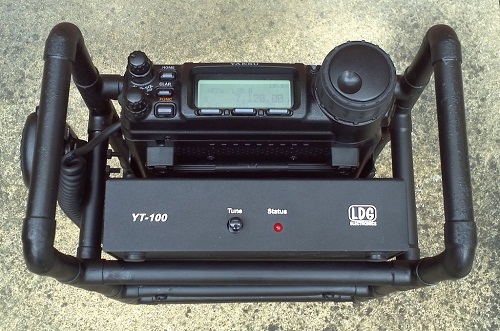 I’m pleased to say that it fits nicely into both my backpack and bike panniers – There’s room for the FT-857D, LDG YT-100 ATU and a 7Ah or 12Ah SLAB. 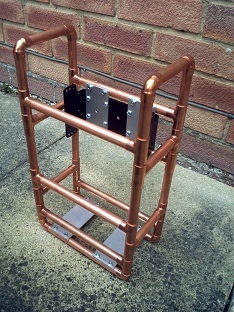 Parts used were 15mm copper water pipe (from Homebase) – It’s deceiving just how much pipe you actually need! 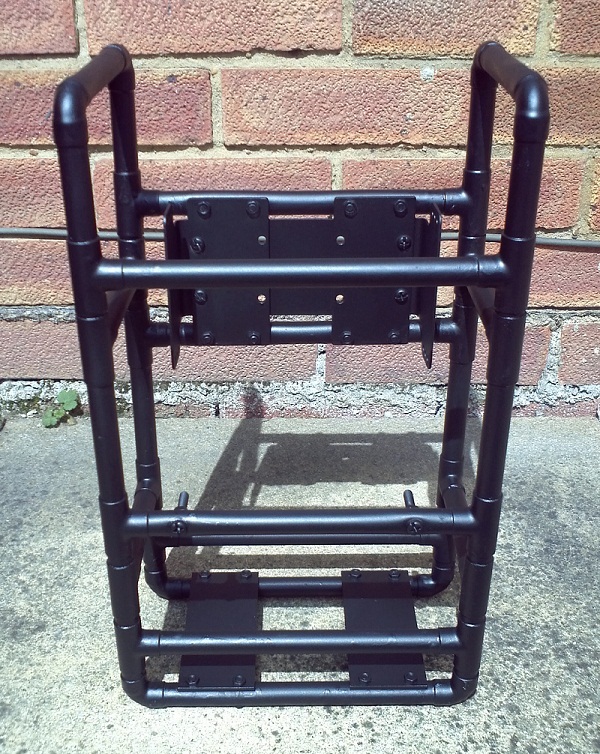 I used just under 4m (bought in 2x 2m lengths) plus 8 elbow joints and 20 Tee sections. That’s about £28 of bits if you’ve got the tools and other bits to hand. If you have to buy everything from scratch, you’re looking at about £70. I used a cheap pipe cutter which I already had in the toolbox. The aluminium plate (£2ea) came from Aerial Parts of Colchester. The overall dimensions are 230(w) x 400(h) x 150(d)mm. 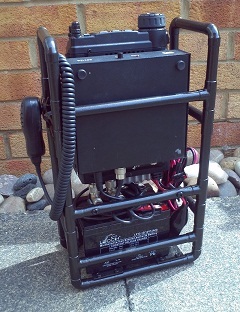 The sections were placed to fit around my particular equipment but there’s no reason why you can’t use any other radio/ATU combo – In fact, any radio that has a mobile-mounting bracket will work. Just make sure that the whole carcass fits inside your backpack! Here it is, sprayed black using “stove paint” from Homebase – I could have cleaned the pipe better after soldering as the flux residue prevents the paint from adhering properly. It’s possible to move the paint like it’s still wet – So, if you think you’ve scrubbed the pipe plenty, scrub it all over again just to be sure. Still, for a first-go, it’s not ‘arf bad… I’ve since given the frame another rub-down and applied 2 coats of Hammerite “Direct to Rust” (black, hammered) spray. 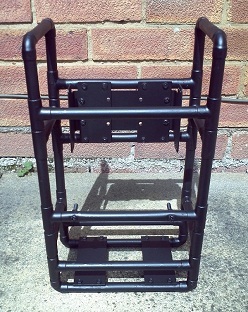 The LDG ATU rests on the rear feet of the FT-857 and against the front bar of the frame. I add a piece of cloth between the ATU and bar during transport to prevent vibrations – The whole lot just about fits into the fram and the backpack! A late-addition was a mic clip attached to the left-hand side – This was a junkbox item that I thought would be useful to have. The display (on the picture at the top) isn’t as clear as it should be – I have to change the contrast level when using it outside of the Shack. This depends upon whether you’re sitting in front of it or if it’s laying flat. The display is clear, even in daylight – you just need to adjust the contrast accordingly!